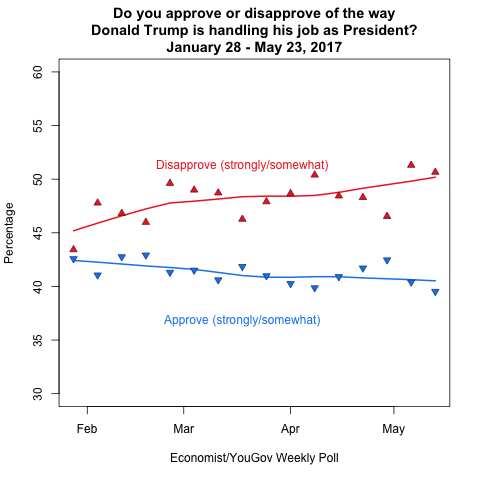 May 25, 2017, 8:06 p.m.
After the last few turbulent weeks, it should come as no surprise that the latest Economist/YouGov weekly poll continues to show Donald Trump&apos;s job approval numbers underwater. This week only 39% of Americans approve of the job he is doing as President while a greater percentage, 51%, disapprove. Our results are in line with other national polls that find more people disapproving than approving of the way President Trump is handling his job. The surprising thing is how stable the President&apos;s job approval numbers are in spite of all the fantastic headlines. Our analysis indicates the overall approval of Republicans remains strong while the intensity of their approval is receding. We analyzed the data from the 17 Economist/YouGov weekly polls conducted since Donald Trump assumed office in January. Each week our panelists were asked, "do you approve or disapprove of the way Donald Trump is hanlding his job as President?" The response options were "strongly approve", "somewhat approve", "somewhat disapprove", "strongly disapprove", or "not sure". Total approve is the combination of both "strongly approve" and "somewhat approve". While total disapprove is the combination of "somewhat disapprove" and "strongly disapprove". The individual points in the graphic above depict the actual total approve/disapprove numbers reported in that week&apos;s survey. The lines reflect the smoothed trend for total approve or disapprove. Our analysis suggests a slight trend of decreasing job approval for the President. We say slight trend because it is important to note that the percentage of people approving President Trump&apos;s job handling has barely moved. His highest approval number in our data was about 43%, while this week ties for the lowest with only 39% approving. That is only a 4 percentage point drop. With the exception of the first week after taking office, President Trump&apos;s disapproval numbers have ranged between 46% and 51%, only a 5 percentage point increase. Furthermore, a closer look at the responses of self-identified Democrats and Republicans mirrors consistency in responses. Among Democrats, the consistency in low job approval is not surprising -- especially considering Trump&apos;s Democratic opponent earned more popular votes in the general election. Trump&apos;s approval numbers with the Democrats have ranged from only a high of 18% to its current low of about 11%. Basically there isn&apos;t much more approval for Trump to lose from Democrats. 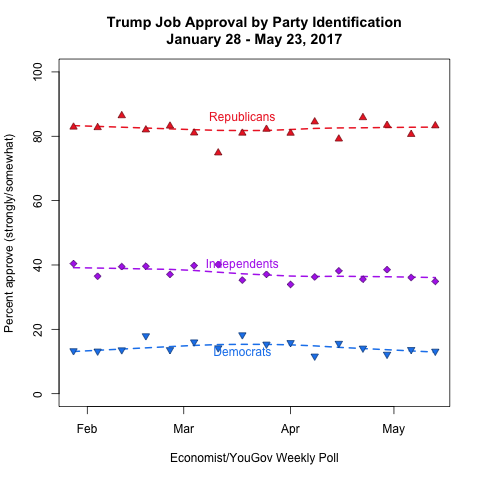 Among those who call themselves Independents (or at least refuse to identify themselves as Republicans or Democrats), the President has lost a few points of approval. He has gone from 40% approval to 35% approval among this group. While indicative of a trend, the changes are not very large. Most surprising to some, perhaps, is that even after the turmoil of the last few weeks, President Trump still enjoys 80% job approval from his fellow Republicans. This consistency suggests the President has an extremely strong base of support. With the exception of one week in mid-March (around the time of the first, failed attempt to pass the AHCA in the U.S. House of Representatives) President Trump&apos;s suppport among Republicans has remained in the low 80s. However, all is not perfect for the President. 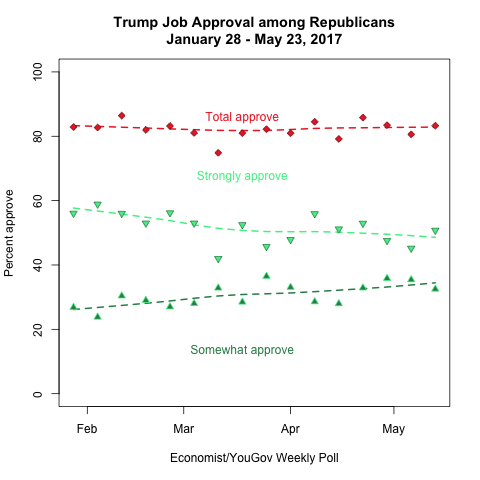 A deeper analysis of Republican job approval numbers suggests that perhaps intensity of support is beginning to wane. The trend shows that the percentage of Republicans who strongly approve of President Trump&apos;s job handling is declining. This analysis implies that Republicans are shifting away from strong approval to the weaker, somewhat approval of the President. This may lead to eventual decline in his overall approval number, but that remains to be seen.